To me, the very least of all saints, this grace was given, to preach to the Gentiles the unfathomable criches of Christ, and to bring to light what is the administration of the mystery which for ages has been hidden in God who created all things; so that the manifold wisdom of God might now be made known through the church to the rulers and the authorities in the heavenly places. This was in accordance with the eternal purpose which He carried out in Christ Jesus our Lord, in whom we have boldness and confident access through faith in Him. Paul refers to himself as the very least of all the saints, to whom a grace was given to preach to the gentiles. Is this some form of false humility ? (after all, this is the same man who wrote more than half of the New Testament … the same Paul who was and would continue to plant churches all over Asia Minor among the gentiles.) Not in his mind, at least. He has a very clear memory of how he persecuted the early christians, contributing the execution of many under Jewish law. He was on his way to arrest more in Damascus when God finally knocked him of his horse, quite literally. A quick look back at Acts 9:1-2 indicates the degree of his zeal against christians (“murderous threats” according the NASB). Acts 9:3-36 shows the early stages of his conversion. 1 Cor 15:9 shows us what he is actually thinking. There is no doubt that he possesses a clear doctrinal understanding of Christ’s efficacious sacrifice of blood and death on the cross; but he is setting the stage to introduce a new character … “grace”. Did you see that contrast between verse nine and verse ten ? He calls himself the least worthy but follows it up by saying that he worked harder than any of the other apostles. This does not look like an attempt at humility or even of pride … this is objectivity. The context of this contrasting concept is set in the grace of God. He not only states that God’s grace was bestowed upon him (a privilege to preach the Gospel), but another grace is expressed that it was a grace working through him to empower him to work harder than all the others! Paul recognizes that his conversion and new mission are in accordance with a plan set long ago Eph 3:11. He expresses something in Eph 3:12 which is in stark contrast to his previous religious training however. “In him and through faith in him we may approach God with freedom and confidence.” NIV This is nothing like the priestly training a practices of a pharisee! A trained pharisee knew that God could only be “approached” through the satisfying of the law. In fact, only the high priest was even allowed to enter the Holy of Holies in the temple to make a sacrifice according to the strictest rules. (with bells on his robe and a rope around his waist to pull him out in the event that he made a mistake and God struck him dead on the spot) Talk about shaky grounds !! In case you skimmed over that … They tied a rope around the high priest’s waist to pull out his dead body if he made a mistake during the performance of the offering !! Here Paul now says, we can approach the Father with freedom and confidence. Other translates use “boldly”. How can this change have taken place. From being afraid to approach God to being freely confident and bold ? Let’s jump back to the previous chapter Eph 2:8-9. Saul, the law keeper, was changed into Paul, the grace speaker. Rom 12:2 reminds us of the difference between outward conformation and inner transformation. 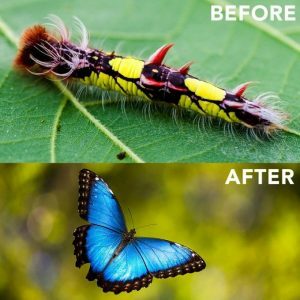 The caterpillar is meant to be metamorphasized into something completely different. 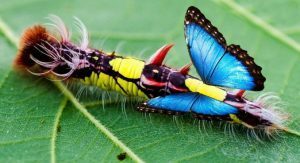 How silly it would be to see a caterpillar with butterfly wings glued to its back ??!! Wouldn’t this look silly ?! This is a “shortcut”, this is not transformation !! When we try to generate the fruit of the Spirit without the work of the Spirit, we merely create hypocrisy … and it’s obvious to everyone around us. Another friend of mine said it well “If you have to tell people around you that you are a christian, then you are doing something wrong indeed”. He is more correct that most of us will ever know.